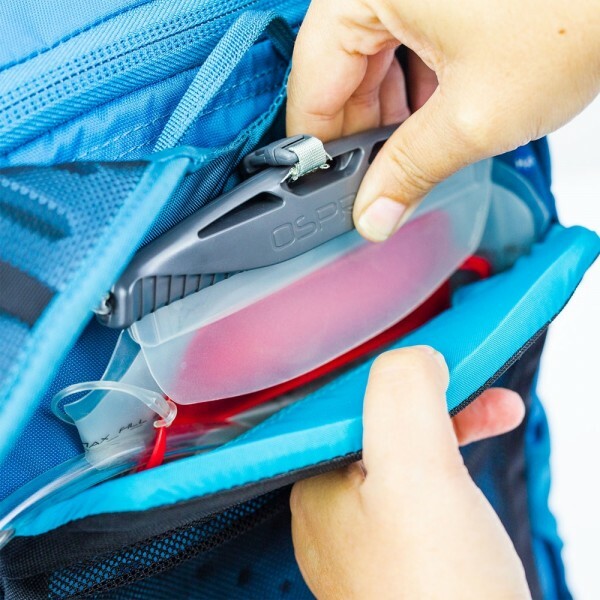 The latest in Osprey’s line of daypacks the Skimmer does not disappoint. The first thing you notice when you take it out of its packaging is, of course, its eye-catching colour. 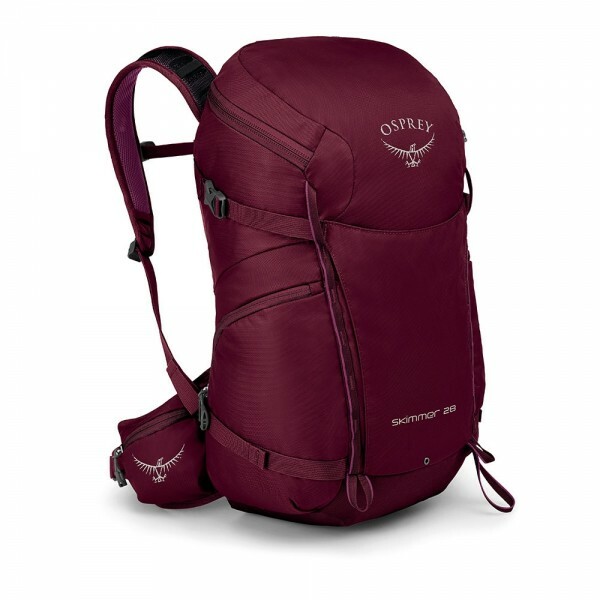 Osprey are known for their iconic and tasteful colour choices and this pack is no different. Available in ‘sapphire blue’ or ‘plum red’ these colours ensure you are both stylish and visible when out and about. Delving into the specifics of the pack the next thing you might notice is a squishy bottom – this is where the integrated raincover is stored. 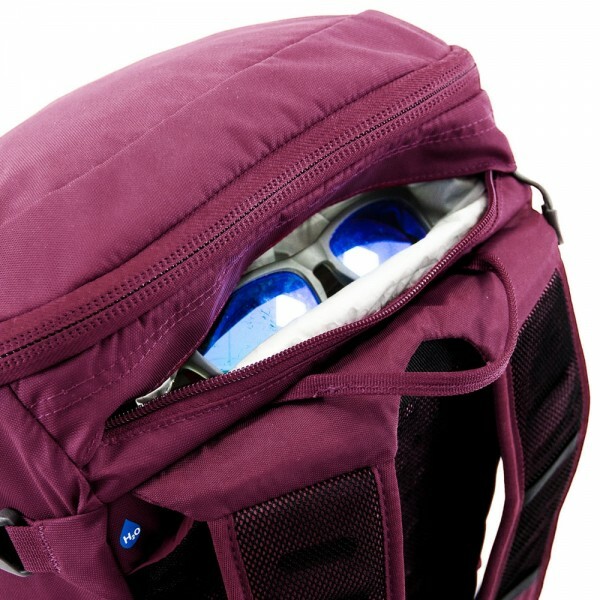 It simply pulls out and up and over the pack giving your valuables the extra protection they need on those days when the weather takes you by surprise, and is attached to the pack by a toggle so you won’t lose it. 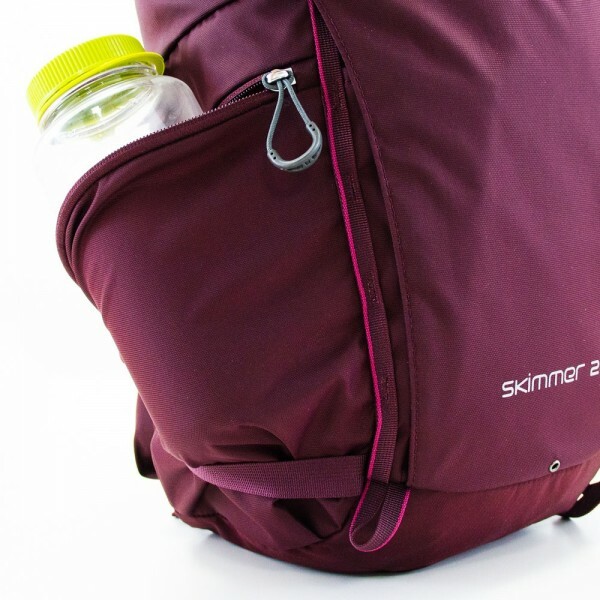 The Skimmer of course features Osprey’s innovative women’s specific back system design (if you are looking for the men’s version, the Skimmer is the sister to the Skarab daypack). This is where Osprey packs stand head and shoulders above the rest. Having tried numerous packs over the years, only to end up with neck or back pain, I am pleased to say that Osprey’s assertion that the Skimmer is perfect for “year-round day-long adventures” is true. The bobbly AirScape™ ‘Bump-Foam’ back panel, harness and hip belt provide absolute comfort and support for the wearer even when the pack is full and heavy. On initial inspection, you might think there are no pockets for easy access to your essentials. However I should not have doubted Osprey and their ability to predict what their users need: there is a very hidden scratch-free pocket right at the top of the back panel which is perfect for essentials such as keys, phones and wallets. There is also an external hydration sleeve for a reservoir, two side pockets big enough to hold a 1l water bottle and the bucket-zip access means the rest of your belongings and safe and easy to reach. Osprey are always one-step ahead in predicting their customers’ needs and this pack is essential for any hiker, walker or commuter.